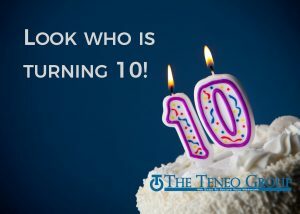 WASHINGTON, DC – August 24, 2017 : The Teneo Group marks a milestone this August celebrating 10 years of business. The network security company has grown to service over 200 major companies in the mid-Atlantic region of the country from offices in Washington, DC; Pittsburgh, PA; Raleigh, NC; Columbia, SC and Winchester, VA.
About vSEC certification- vSEC (Virtual Security) protects assets in the cloud from the most sophisticated threats. Dynamic scalability, intelligent and automated provisioning, consistent control across physical and virtual networks, ensuring east west visibility and efficiency across the entire the network. About Teneo – The Teneo Group protects the networks of their clients by providing security consulting, architecture, installation and support. The Teneo Group, based in the Mid-Atlantic, serves clients across the globe.